My mother tried to get me out of Breslau whenever Hitler visited the town. Once I went to a small village on the banks of the River Oder which was in flood, but the waters covering the meadows through which the village children and I waded were quite warm.” The memories of Kenneth Graupner, formerly Klaus Gräupner, come to mind at the travelling exhibition at the Berlin City Hall this fall, As Time Flows By. Twenty panels depict Jewish life along the River Oder, or Odra, from its beginnings to the present day. The river has carried many conflicting narratives, memories, and allusions with it since Ptolemy referred to it in the second century c.e. Today, it is Poland’s third-longest river, running from the Czech Republic to the Baltic Sea. It flows through many cities and touches many Jewish sites. The landscape, with its changing dominional and national affiliations, has been a melting pot for centuries. Also German-Jewish and Polish-Jewish cultures crossed here. In modern times, nationalism, coupled with anti-Semitism, threatened this cultural diversity. National Socialism destroyed it. After the Second World War, the Oder River became the German-Polish border. The German population from regions east of the river was expelled. Polish citizens found a new home here and for a short time it seemed that Jewish life could emerge again in Lower Silesia and Pomerania. Several tens of thousands of Polish Jewish Holocaust survivors settled here, but due to anti-Semitic violence most emigrated by the end of the 1960s. The centuries-long presence of Jews on the Oder fell into oblivion, their traces were often destroyed. The exhibition has been designed by the German Culture Forum for Eastern Europe (Potsdam). The visitor learns that in regions which before WWII were part of Pomerania, of the Neumark area of Brandenburg, or of Silesia – all of which belong to the western region of Poland since 1945 – there was a Jewish cultural presence since the Middle Ages. It developed as a result of trade and of immigration from both East and West. Over centuries, the Oder region became a place in which different cultural influences crossed paths and mutually enriched one another. From at least the 19th century onwards, this led to a unique cultural and economic upsurge, which turned cities such as Bres­lau (today Wroclaw), Görlitz, Frankfurt and Stettin (Szczecin) into centers of art and culture, science, and business. As Time Flows By explains how with the realignment of Europe after 1945, the history of the former German Eastern provinces has largely been forgotten. Jewish history was particularly affected by this. “The exhibition is dedicated to moments of Jewish history on both sides of the Oder,” explained the curators at its opening at Berlin’s city hall. “We want to stimulate reflection and conversation between the former and present inhabitants of the region. It is also an invitation to rediscover the German-Polish-Jewish cultural heritage of this landscape.” Indeed, there are many Jewish spaces to explore alongside the border river. In Görlitz, the splendid synagogue from 1911 has recently been thoroughly renovated. 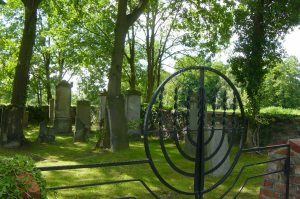 In Groß Neuendorf, a small village in eastern Germany on the Polish border, one comes across a Jewish cemetery, the only visible reminder of the small Jewish congregation which thrived here in the 19th century; the former synagogue has been converted into a private home. 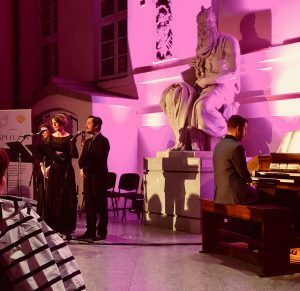 In September, the Days of Jewish Music in the Baltic port city Szczecin met an enthused crowd when the Vox Varshe singers and organist Jakub Stefek renewed and transformed the musical tradition of Stettin’s prewar Neue Synagogue, which is so closely connected with the Jewish composer Louis Lewandowski.